And onto the older home tour…. front door. bathroom door (left). bedroom door &closet (right). Hallway leading to Marlowe’s room (left) &kitchen (right). 10$ ugly find. I snazzed it up. Picture this: me while VERY pregnant, painting while in a bikini and a HUGE belly, &a fumes mask. Fun! Then I made cushions. living room &a peek into Marlowe’s room. over the couch is an open “window” to my bedroom. (mostly bad) records. children’s guide to knowledge. the little prince. hippie. john travolta staying fit! bathroom. of course I also have: a sink and toilet (not pictured). making showers fun: mouse ears &gnome soap on a rope. kitchen. dirty diapers in sink. my least favorite space. this is typical. I have yet to use the dishwasher. spices. cutting boards. pizza boards. handy tools. some wine for cooking– some for drinking. favorite pot. collection of meaningful things. bread box. party ball. pep talk after child birth. looking through the “window” into my bedroom. rabbit with a not-so-lucky-foot. bird house. old ac hardware. deer. hallway from bedroom to living room (left) &closet (right). my large catch-all closet. clothes. two strollers, shoes, linens, fabrics, luggage, boxes, you name it– its in here. It’s really my only storage space in my whole home. bed. bedside table. window to living room (right). robot with fallen head. fabric. stamps. books. felt. strings. & a peek into Marlowe’s room. dollhouse. crib. changing table. I have an even more mini home – I live on a boat – and this has inspired me to think about blogging a tour! OMG, long time reader. I love, love, love your home. I wish I had your sense of style. It is simply gorgeous. Your home is a perfect culmination of personality! It's perfect and it visually represents how strong you are as a woman and single mom. Rock on! love the high chair you created and i still want some Marlowe's aftermath. I love everything about your home and envy your creativity! Thank you so much for posting this! I was just about to go out furniture hunting and now I have tons of inspiration! does the couch have a brand? that is EXACTLY what i am looking for-and am wondering how i would begin my search. your house is so beautiful and airy! Your house is so super cozy and neat!!! Love the yellow couch, did you have it refinished or did you find it that way at the Goodwill? Love everything in your house. So bright and cozy looking! you paid 50 bucks for that amazing couch??? daaamn such a good deal. i have to say, our styles are so similar its kinda scary. your home is perfect! ahhh it is SO cute!! I am obsessing over that shower curtain. I love it. Oh, and the coffee table! What a lovely home. Great light and some really lovely finds. Love the colour of your walls too. I love how clean but colorful everything is!!! I aspire to have a home that looks like this very soon! @Amy: You MUST to do a boat tour. That would be awesome! @Jess: Thank you so much! @The Girls: What a great thing to say! Thanks! @Lil muse lily: You're right this home isn't actually THAT small. It's 3 times bigger than my last two places. @mommatojoa: Thank you. Funny thing is, we are repainting Eric's house from neons to grays right now for when I move in. @mommablogsalot: Or spring! Don't wait until summer! @Hannah: HA! Glad I could help! @Bekah: It is clean! I'm obsessive about tidiness. @Melissa D.: The tag says "American of Martinsville" I did a quick google search and I'm not finding anything. From the castors on the bottom, it seems to be pretty old. @Jennifer: found it as if at goodwill. There's a small fabric tear on one side. Otherwise its perfect. @DK: Welcome! Thanks so much for coming by! @Adriana: find of the century. Oh, you have the cutest house! super cute blog! your house is so darling! I would love to live there! I'm also a single Mama and a new follower! I LOVE home tours & yours is so perfect! I love the fun details! Your entire house is so cute, I absolutely love it. It seems very homey and warm, but at the same time not cluttered and a huge mess. Very cute! I just love your blog and your beautiful Marlowe, and your house tour post was so calming and beautiful! You've made such a lovely space for yourself and your little dove. Your home is so cute and colorful. I love it! Thanks for sharing. Hi I found you via Sometimes Sweet. Love your bright and cheery home! Thanks for sharing. BEAUTIFUL home! I love it! So much beautiful light, I love it. WOW what a cute house you have!! I love the colors and little details! You can tell you pay attention to detail! Beautiful home and beautiful family you have! So pretty and bright. We are both girls who love our color! I noticed your bottle of Our Daily Red. I love this wine! Not only organic, but soooo yummy! I know I'm a little late with this, but your home is amazing. I have a tiny house too and know it can be super challenging to keep things clutter free, but you did such a great job decorating. Love the pops of color everywhere! i love your home, it is so quirky and cute, just right for two ladies! Love the tour! What fun colors and prints… I'm in *love* with that shower curtain, where did you find it? I really like how you decorated the place, especially your mint green wall. I noticed the diapers drying in your kitchen and I was wondering what brand you use since I want to switch to cloth diapering for my 3 week old daughter 🙂 Thanks in advance! just found you on top mommy blogs 🙂 LOVE your petite house. it's gorgeous and NICE style. did you make the tree on marlowe's dresser? obsessed with your house. um. amazing. nuf said. 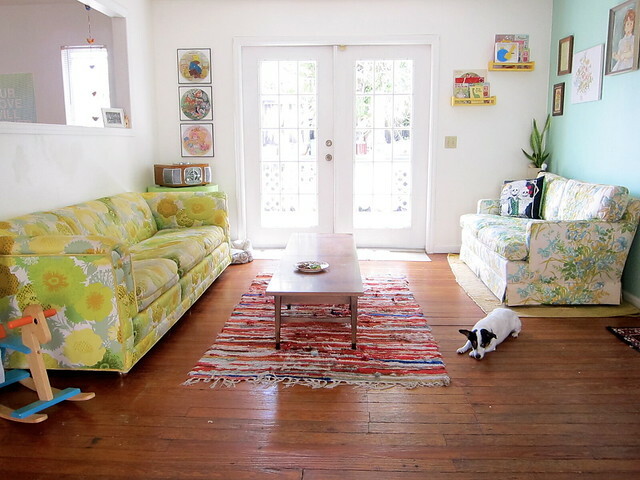 Love your house, reminds me of Todd Selby's photos and book, good stuff! Thank you all again! Such nice words! fyi i just showed my husband all of these pictures because i had been talking about your house forever and i think it was driving him crazy. i just love the way you decorate, so simple yet so charming. makes me excited to move into a new house and start some declutter up in here. I must know, where did you get the blanket on your bed? It is pretty much everything I have been looking for and unable to find. I LOVE the highchair you painted! Do you remember the name of the color you used? @brit van r: I'm sorry I don't! I'm the dumbass who doesnt keep paint swatches. I really should. Sorry dear! i'm in love with the fresh, bright place –all the colors, all the white. I think I'm in love with your house…Can Makena and I move in? Now if you see my last post…my house is a disaster.. I want to go home and clean it up and make it all look dreamy like your place! I am in love with Marlowe's room! It's a mix of nostalgic and funky-fresh; great color palette with items that go *so* well together. I might as well go ahead and admit that I'm in love with your entire home. I'm not an architectural guru, but it strikes me as a beach bungalow with indie/retro vibes just poppin' from every nook and cranny! Again, you have a real knack for color and I appreciate your clean and simple take on life. Reasons why I follow your blog: we lead very different lives, but have a lot in common: a love for vintage, pops of color, sunshine, sewing, photography. You have inspired me to take on a "less is more" approach for when I design my future bebe's bedroom (I'm only 5 weeks preggo, so I've got plenty of time to collect goodies from yard sales and thrift stores!). Thank you for posting these amazing photos of your adorable home! Oh… the light and that yellow couch! So colorful and clean. Love your home tour, Drea. Your house is amazing. The colors are great and it doesn't look tiny at all. The work desk, how do you keep it so organized?! I love the blue color on the walls in the living room. Do you know what color it is?? I am in love with your floral couches. Your home is beautiful. Your home is AMAZING! Beautiful & so inspiring 🙂 Thanks for sharing! I love your home…so cute and inviting and wow, all that color!! Im a bit jealous and now think my house needs a good revamping!! One question, is that a homemade blanket/quilt hanging over the window to your bedroom? I just love the vintage sheet type feel is radiates!!! I absolutely love your home! So quirky and cute. I love the colors and your overall style. It looks so welcoming! i'm on your fridge! i love you. you are one of the best people i know. Did you make your play tent? And if so, did you have a tutorial? and I added the link to this page too! Thanks for reminding me to do so! I really enjoyed all of your home tour posts – thanks for sharing! Hi! Your house is awesome. I noticed the tea pot on your kitchen window. Do you know anything about it? I have a casserole dish that has the same pattern. I love your house! My house definitely needs some revamping and I am using yours as some serious inspiration. What make and color is the turquois-y paint color that you have in many of the rooms through out your house? Thank you! Keep it up! Random question about that wooden high chair. Does the tray remove completely from the chair or is it on some kind of hinge? If the former, what kind of removal mechanism does it have going on? Thanks!